Automatic external defibrillators are one of the essential medical tools to have one your premises because it can provide vital lifesaving services for cardiac arrest. Building operators and people in the medical field are usually the people are who trained to use this equipment but now anyone can be trained. The expert team at Chesapeake AED Services can provide you with a wealth of information on AED CPR training and which AED to purchase. We provide comprehensive training programs and information for all things AED related so you can be better prepared. For more information on training and the importance of AED, contact a member of our team. We look forward to partnering with you to ensure that your building has the proper AED equipment installed correctly and that people in your building are suitably trained for AED use. An automated external defibrillator (AED) is a lightweight, portable device that delivers an electric shock through the chest to the heart. The shock can stop an irregular rhythm and allow a normal rhythm to resume in a heart in sudden cardiac arrest. Sudden cardiac arrest is an abrupt loss of heart function. If it’s not treated within minutes, it can quickly lead to death. Most sudden cardiac arrests result from ventricular fibrillation. This is a rapid and unsynchronized heart rhythm originating in the heart’s lower pumping chambers (the ventricles). The heart must be “defibrillated” quickly because a victim’s chance of surviving drops by 7 to 10 percent for every minute a normal heartbeat isn’t restored. Why are Automatic External defibrillators important? AED’s make it possible for more people to respond to a medical emergency where defibrillation is required. Because AED’s are portable and can be used by nonmedical people, they can be made part of emergency response programs that also include the rapid use of 9-1-1 and prompt delivery of CPR. Timing is critical when defibrillating (giving a shock) to a patient. If you can administer a shock in 3 minutes from arrest they have a 74% chance of survival. If 5 minutes pass the chances drop 39% and 10 minutes or longer there is almost no chance of surviving. Waiting for paramedics is not enough as the average response time in the US is 6-12 minutes. All three of these activities are critical to improving survival from cardiac arrest. How does automatic external DEFIBRILLATORS work? A built-in computer checks a victim’s heart rhythm through adhesive electrodes. The computer calculates whether defibrillation is needed. If it is, a recorded voice tells the rescuer to press the shock button on the AED. This shock momentarily stuns the heart and stops all activity and gives the heart an opportunity to resume beating effectively. Instructions guide the user through the process. AED’s advise a shock only for ventricular fibrillation or another life-threatening condition called pulseless ventricular tachycardia. It is vital to get quality information when determining which AED to purchase. The team at Chesapeake AED Services has years of experience partnering with many building manager and property owners. From AED CPR training to information about the device itself, Chesapeake AED Services has you covered. 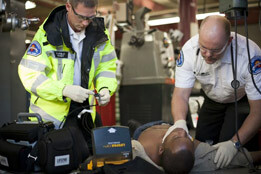 We have been a leader in AED sales and defibrillator training in Baltimore for years. Remember, there are many AED many manufacturers on the market, varying in price and features. Click here to learn more about which AED is right for you.